Viezu Technologies is excited to announce a new range of tuning and styling packages for one of the world’s true supercars, the Ferrari 458, which are available to buy online on the Viezu Store. The Ferrari 458 has been treated to three levels of tuning and styling package, which will really boost the power and performance of your Ferrari 458. The first level of tuning is a fully tested race and track ready performance ECU remap, which will absolutely transform the power of your Ferrari 458. The Ferrari 458 performance ECU remap takes its standard bhp of 560 and adds a further 25bhp and an extra 15nm torque. This might not sound like a lot but on a true supercar like this the extra power is phenomenal and will make your Ferrari 458 a real dream to drive. The level two package adds a less restrictive air filter to the race and track ready performance ECU remap, which for a normally aspirated engine is essential to aid airflow throughout the engine and really brings to life the Ferrari software upgrade, providing a nice increase in induction noise which perfectly complements the increase in performance. Level three consists of a custom race engineered exhaust system, providing the howling exhaust note expected from a Ferrari 458 race car, while the filters give a crisp induction sound and the Ferrari 458 performance ECU remap brings all the upgrades together to provide better throttle response, more torque and more power. 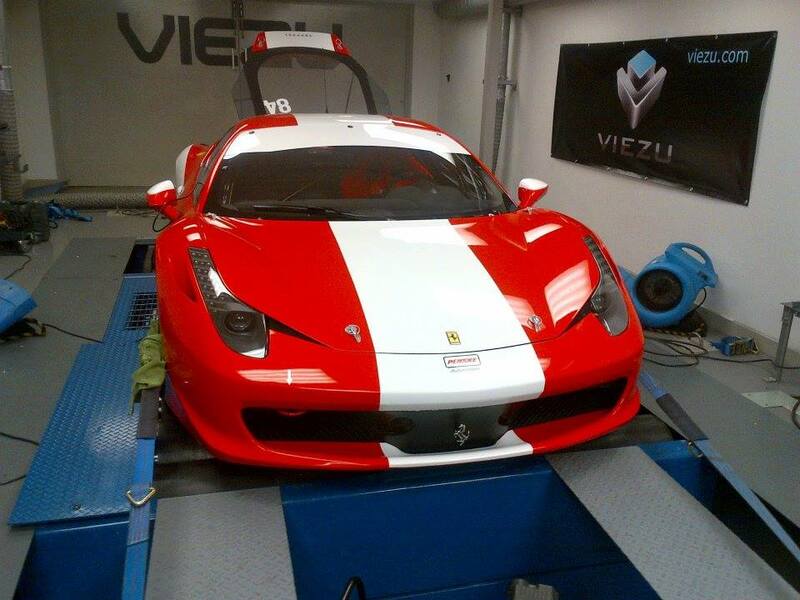 For more information about how Viezu can help you transform your Ferrari 458 into a true track-ready racing car, please visit www.viezu-store.co.uk, call us on +44 (0)1789 774444 or email info@viezu.com.